Pictured from left: Tadanobu Hirayanagi, teachers’ consultant with the Board of Education, City of Nagoya; Trinity Custodio; Laurent Hirakata Chang; Briana Morales; Yani Martinez; Wendy Monroy; and Yoshinori Kondo, director, City of Nagoya Tourism & Exchange Department, Bureau of Tourism, Culture & Exchange. Four high school juniors attending the Los Angeles Unified School District (LAUSD) embarked on a whirlwind 21-day cultural discovery trip to Japan recently that included tours of landmarks and people-to-people exchanges. The students were selected from a highly competitive process from high school students around the County to be the 2017 Youth Ambassadors to the City of Nagoya. 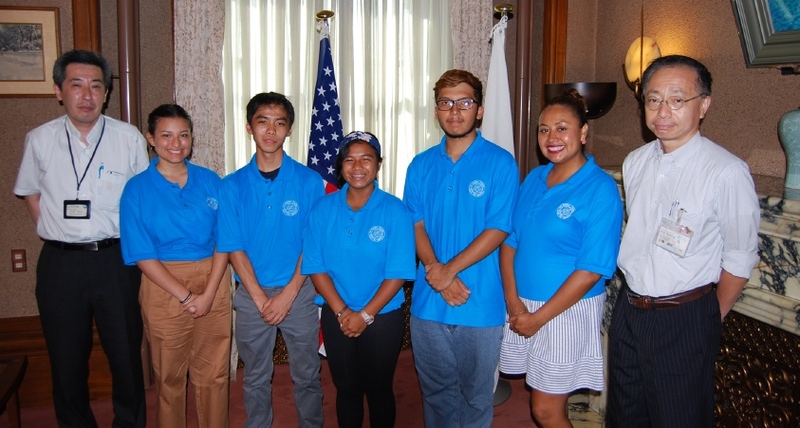 This year marks the 27th time that Los Angeles has sent high school students to Nagoya under the sponsorship of the Los Angeles Nagoya Sister City Affiliation (LANSCA). The 2017 youth ambassadors are Laurent Chang from William Howard Taft Charter High School; Trinity Custodio from Eagle Rock Jr./Sr. High School; Yani Martinez from Huntington Park Institute of Applied Medicine at Marquez High School; and Briana Morales from Ramon C. Cortines Visual and Performing Arts High School — all part of the LAUSD, the largest (in terms of number of students) public school system in California and the second-largest public school district in the U.S.
A significant part of the program is for the student ambassadors to experience Japanese family life. During the first two weeks of their three-week trip, the ambassadors, accompanied by their chaperone, Wendy Monroy, secondary mathematics instructional coach at Narbonne High School, who was named L.A. County Teacher of the Year for 2013-2014, lived in the homes of Nagoya families. During those two weeks, the delegation attended local high schools, attended classes, and participated in after-school activities such as sports and student clubs. There was also instruction in the Japanese language, visits to the historical and cultural sights of Nagoya, and appearances at various social functions. In addition to participating in all aspects of Japanese classroom lessons and school activities, members of the delegation shared their American high school life, participated in a cultural performance to showcase their respective unique musical talents, and engaged in open dialogue with Japanese government dignitaries and city officials. Following the two-week stay in Nagoya, the delegation spent another week touring cultural highlights and UNESCO World Heritage Sites in Hiroshima, Kyoto, and Tokyo. Upon returning home, the delegation has been invited to participate in the upcoming Nisei Week Parade and the “Nagoya Through My Eyes” program, in which they complete a cultural research project based on their recent experience and give presentations in front of dignitaries on both sides of the Pacific at an upcoming dinner. They will also volunteer at various LANSCA events and host visiting student ambassadors from Nagoya during 2018. To be chosen, each member of the delegation, including the chaperone, submitted a detailed application outlining his/her interest in learning about Japan along with two letters of recommendation and an academic transcript. Based on these materials, the finalists received an invitation to interviews for the ambassador position, where they demonstrated the maturity to beneﬁt from the experience and to serve as a representative of LAUSD, the City of Los Angeles, and the United States. According to LANSCA Chair Teruko Weinberg, President Dwight Eisenhower began the Sister Cities Program in 1956 to promote cross-cultural understanding and citizen diplomacy. The affiliation between Los Angeles and Nagoya, named one of the “strongest sister-city programs in the country” by former Deputy Consul General of Japan Izuru Shimmura, began in 1959 and was the first such affiliation for either of these cities. A program of student exchange visits between the two cities started in 1960 when a group of Japanese students visited the Los Angeles area. Reciprocal visits have continued since that time. Located in the heart of central Japan, Nagoya operates the largest and busiest trading port in Japan, which is one of the U.S.’ largest trading partners, and accounts for approximately 10 percent of Japan’s total trade value. Similarly, according to Norman Arikawa, LANSCA board member and past chairman, the Port of Los Angeles, also called America’s Port and Nagoya’s Sister Port, has long been America’s gateway to the Pacific Rim and thrives on international trade. Incorporated in 1965, LANSCA is a 501(c)(3) nonprofit organization staffed by volunteers to assist the city and the mayor of Los Angeles in the many activities and functions that surround its sister-city relationship with Nagoya. Together with Sister Cities of Los Angeles Inc., a nonprofit corporation that oversees all of the sister cities of Los Angeles, LANSCA participates in the activities of Sister Cities International, an organization formed to help sister-city programs throughout the U.S.